Helas Verona has played 10 Italy Serie B matches this season away from home. On away ground Helas Verona has won 6, drawn 2 and lost 2 matches. This ranks Helas Verona 1st in away team performance in the Italy Serie B. When looking at Pescara home performance in league points, Pescara’s performance is greatest when looking at opponents in the bottom 6 with an average of 3 points per game. Against opponent such as Helas Verona that is currently placed in the top 6 of the Italy Serie B Pescara has managed to collect an average of 1 point in 5 matches this season. 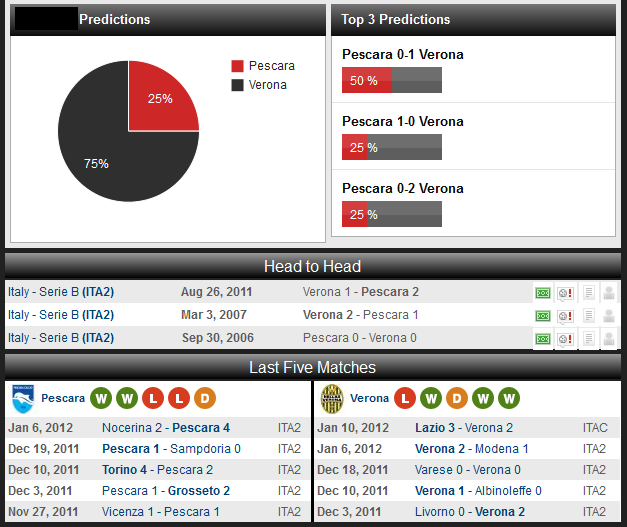 Concerning matches played at home against the top 6 this season Pescara has collected 1 point on average in 1 match.